SOLD! - A GOLFERS PARADISE! $2,395,000! Attention Golfers!!! 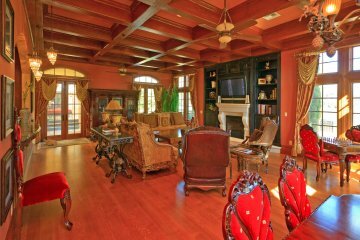 This is the most coveted golf course lot in this prestigious country club community!! (No neighbors in rear!) 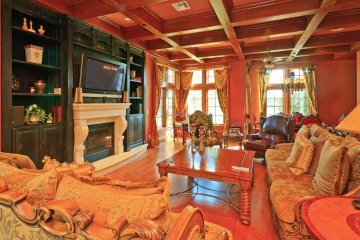 Builder's personal home with many, many upgrades and fabulous amenities and top quality construction ! Dramatic winding 2-story staircase at entry! 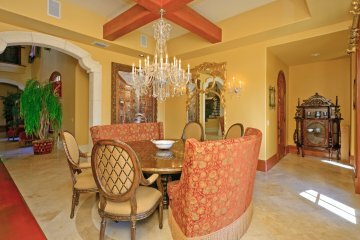 A grand Gathering Room overlooks a tremendous expanse of the golf course and has an open breakfast bar to the gourmet kitchen! 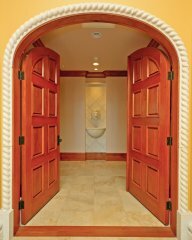 Golf-front master bedroom suite on the first floor boasts a sauna, laundry facilities, jetted tub with waterfall feature, a walk-thru show and adjoining 20' marble Bath ! 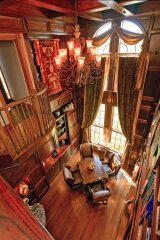 The gathering room is accented with rich beams in a towering ceiling, custom entertainment center and warm wood flooring and grand fireplace. The views from this room are awesome - and this is where you will do a lot of living! 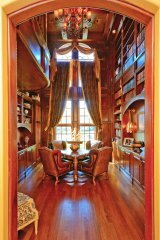 Exquisite 2-story Library/Office with 2-story shelving, gorgeous wood paneling & floors! 3 interior Laundry Rooms for great convenience!! 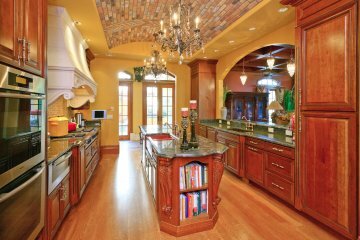 Kitchen boasts double hi-quality appliances, granite, stonework! 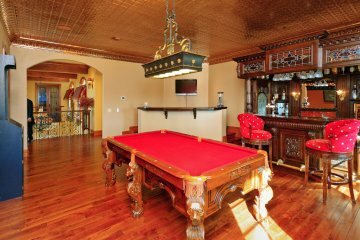 Oversized Billiards Room with copper patterned ceiling, built-in antique Bar w/stained glass, special lighting, icemaker, wine cooler and wet bar! 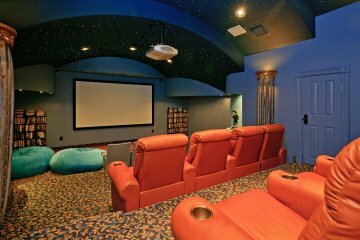 Fabulous Theater with spectacular lighting, tiered seating for 16 people! 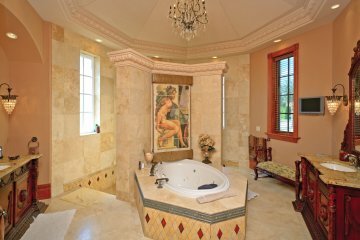 Master Suite has enormous walk-in two-story closet, laundry facilities and spacious adjoining Bath with twin vanities, waterfall feature, walk-thru shower and jetted Tub! 4 other large Bedroom suites each with walk-in closets and full bath. Private staircase leads to 5th Bedroom Suite. with large adjoining Sitting Room or Children's Play/Media Room! Surround sound in & out! Interior fire sprinklers! Attic heat detectors! Lightning rods! Concrete tile roof! 3 Fireplaces (1 outdoors)! 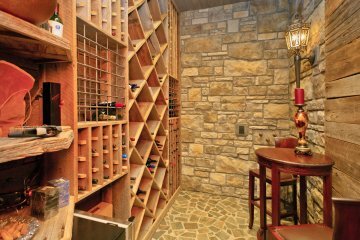 Wine cellar/fall-out shelter with seasoned wood and stone! 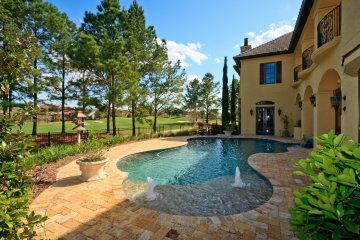 Keenes Pointe is a golf and country club community - gated and manned 24hours a day, 7 days per week. The country club offers a clubhouse, dining facilities, large pool, tennis courts and many activities for young and old. For those looking for a second home - this is the ideal situation. Home is professionally decorated! Just move-in and start living ! 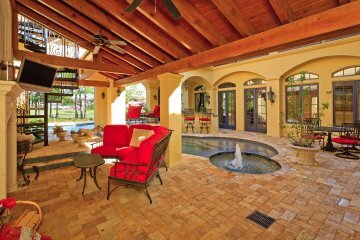 Spectacular outdoor area with fireplace, terraced seating, waterfall feature, salt-water (chemical free) Pool with cascading waterfall, Spa and the most beautiful golf front views! Very special in best location! BRING YOUR OFFER! Owner relocating!